Mission Statement: Friends of Historic Breckenridge is a 501 (c)(3) nonprofit organization formed in 1995 to support the revitalization and renovation of the downtown district of Breckenridge, Texas, to develop interest in our community’s history, to encourage the restoration of existing buildings to their original architectural facades relevent to the early history of our city and to promote pride in our city. The National Theatre is a completely restored and renovated 1920's movie theater in downtown Breckenridge. It is of Art-Deco architecture with seating for 230 in a split configuration with a center isle and right/left side isles. At present it is available for live performances, special events, & party rental. FOHB is in the process of putting together a once a month MOVIE night! Check the Movies & Showtimes page for more information. To see what special events may be happening at the theatre, check the Upcoming Events page. For more information on the National Theatre remodel, go to New & Future Projects page. Breckenridge is the official "Mural Capital of Texas" with 12 murals on walls throughout town. Of the 12 murals, 9 are the original work of art by Billy Ines. The other 3 are from other artists. Mural maps are located at the Breckenridge Chamber of Commerce. An ongoing project is our award winning series of murals depicting Breckenridge's past. Airbrush artist Billy Ines began the projects with signature talent. Just short of "photo-realism", the murals are inspired by vintage oil boomtown photographs by Basil Clemons currently housed at the Swenson Memorial Museum. Most are around the town's major intersection (Hwys 180 and 183). 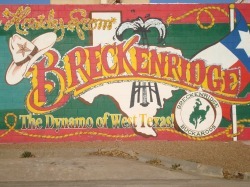 In 2001 Breckenridge was notified that they had ben proclaimed "The Mural Capital of Texas". This designation was passed by the Texas Legislature on January 17, 2001. Go to New & Future Projects page to view a few photos and get info on Mural locations!